The Cathedral School was delighted to welcome 2019 Absalom Jones Honoree Hilton Als to campus on Thursday, January 31, where he participated in a seminar discussion with our 8th graders regarding their experience visiting The Whitney Museum of American Art to view Andy Warhol — From A to B and Back Again. During his time with our students, Als read excerpts of their written responses to the exhibition and engaged in conversation with them about Warhol’s life; discussed representative pieces including Soup Cans and Lavender Disaster; and helped them wrestle with the question, “What is art?” When asked, Als shared his own definition of art: “This right here—anything that brings people together and inspires an exchange of ideas.” With this simple response, Als demonstrated not only his insatiable curiosity but also his regard for community and connection. 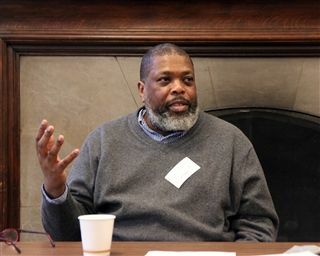 Hilton Als will again address The Cathedral School on Friday, March 1, when he accepts the 2019 Absalom Jones Honor at the Absalom Jones Benefit. Named for the first African-American priest in the Episcopal Church, the Absalom Jones Benefit celebrates equity, justice, and inclusion. All proceeds directly support financial aid at The Cathedral School. Each year, the Benefit includes a short program that celebrates the mission of The Cathedral School and honors an individual—in the spirit of Absalom Jones—whose work in the fields of equity and justice serves as an inspiration for our community. For more information about Hilton Als and his body of work, as well as selected writings from his time at The New Yorker, please click here.